BEFORE: There’s a lot happening today so lets get right down to business. Raising Arizona is the first of a double feature today and is also the lead film in a Coen brothers chain. I’ve scheduled four of their films I haven’t seen and culminating with two of their films I have previously seen. The chain will be interrupted tomorrow as I head back to the theaters to see Skyfall, but before that today’s two films will help get me back on track. So without further ado, Raising Arizona. AFTER: I’m a fan of the Coens and their work. The brothers have a consistent look and feel throughout all their films but comedies in particular. While Raising Arizona is only their second film, their style is still present throughout. However, I found this film to be less entertaining than the Coens’ other films. Raising Arizona has all the qualities you would expect from a Coen brothers film: dry humor, complex and original characters, and most of all a unique story. But unlike their other films, Raising Arizona lacks great execution and consequently, falls flat in many areas. The organization of the film is one key example of this. At the beginning of the film is a narrated prologue where H. I. (Nicolas Cage) explains his background and how he came to meet his future wife Ed (Holly Hunter). Pixar’s UP has a similar opening, minus the narration, that explains the background action to give the viewer a context for the rest of the film. UP’s opening is the example to beat and Raising Arizona does not live up to this standard. (Yes I’m aware it came out 20 years prior to UP, but the comparison is still relevant). With Raising Arizona’s opening, it’s just too long and sets out to explain too much beforehand instead of revealing these details as the rest of the film progresses. UP set up who Carl is as a character and shies away from exposition and what he wants to do. Raising Arizona sets up the main characters but also gives too much exposition therefore ruining the remainder of the film. 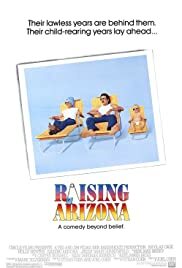 I did chuckle several times and was impressed with the potential I saw in the actors (John Goodman and Holly Hunter in particular) but overall was underwhelmed with Raising Arizona. But while I didn’t find the film that entertaining, I do see it as the beginning for an otherwise great career. You definitely see the seeds of greatness for the Coens’ later films and for that reason alone it’s a good idea to watch and analyze. For a film that you can relax for and enjoy, I’d go with one of the Coen brother’s later films.